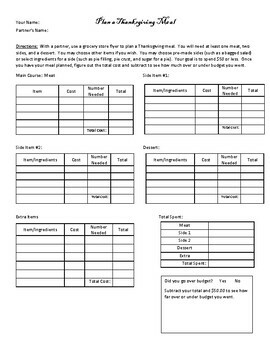 Students will work together to plan a Thanksgiving meal using a grocery store flyer. Students will plan a meat, two sides, and a dessert and then add to find their total cost. Finally, they will subtract to see if they went over the $50 proposed budget. This is a great way to introduce or practice adding and subtracting and even multiplying decimals using real life problem solving!